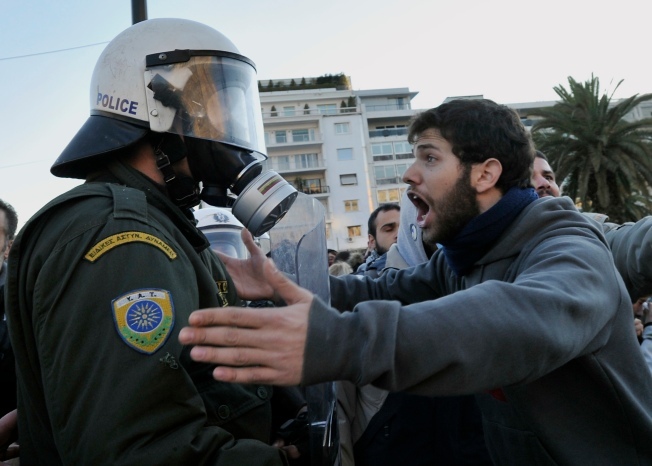 Protesters argue with riot police officers, protecting the Parliament building in Athens, Greece, on Tuesday. ATHENS, Greece — Clashes have broken out between riot police and groups of youths during a demonstration in central Athens to mark a nationwide general strike. Riot police began firing tear gas when a small group of youths threw Molotov cocktails and rocks at them near Parliament in the center of the Greek capital. More than 10,000 people were marching through the center of the city Wednesday in a demonstration to protest the increasingly beleaguered government's economic policies. Emergency crews were preparing for violence after the police shooting of a teenager on Saturday sparked Greece's worst riots in decades.